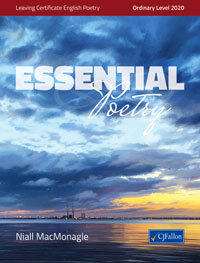 Essential Poetry is a new, vibrant and fully illustrated anthology of poetry for Ordinary Level students. Containing an engaging introductory essay on the art of poetry, this textbook aims to develop the students’ knowledge and understanding of poetic form and writing to help them to achieve the highest possible marks in the examination. The author, Niall MacMonagle, is a well-regarded literary critic and the book is packed with insights into, and useful analyses of, the prescribed poems. ● Comprehensive anthology of the Ordinary Level prescribed poems, with notes and glossaries attached to each. ● Biographical information and overviews on all poets. ● Hints and advice on how to approach the paper. ● Exam-style questions throughout the book. ● Detailed glossary of literary terms at the back.